Bah Humbug Candy Cane Badge in white with Bah Humbug written in a red candy cane font. 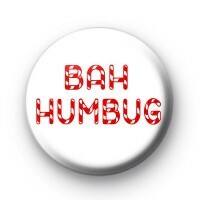 If you hate Christmas this anti-Christmas Scrooge badge is perfect for you. Standard white 25mm badge with red candy cane writing. Copper pinback button badge handmade in our workshop. We have a great range of Christmas badges so be sure to check them out.